← You thought you understood what a postcard was? 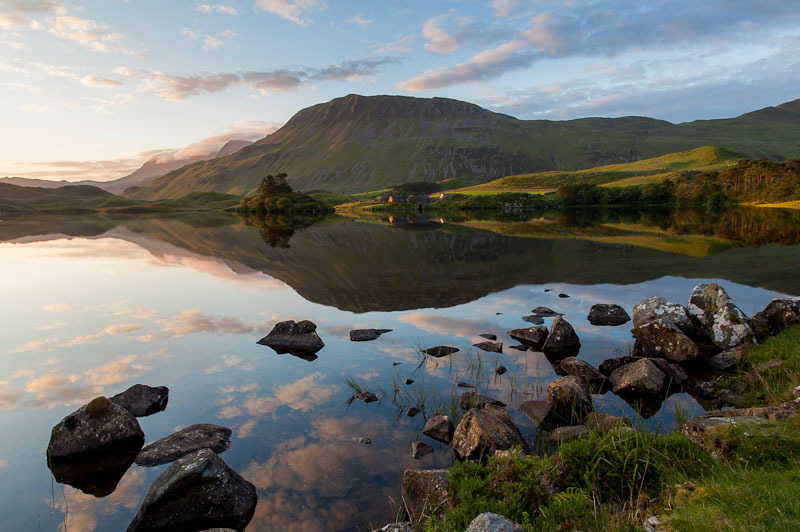 Cregennen lake and Cadair Idris, shortly after dawn, July 15th. It has been such a dismal summer so far that it made a change to almost get it right for once. Llyn Cregennen, near Dolgellau, is one of my favourite photographic locations. This lake, belonging to the National Trust, has an adjacent car-park and is therefore ideal for a dawn session with the camera. The other morning I woke naturally before the alarm went off at 4.35 am, so I had time for a fairly leisurely cup of tea before the first signs of sunrise became visible. It was an almost perfect morning; not a breath of wind and a variety of clouds at different levels. Scattered higher level clouds were moving across the sky from the north and it was these that reddened first; as the sun rose the most intense colour transferred to lower level clouds before that too faded. Interestingly some lower cloud over Cader Idris a few miles to the east actually lowered on to the summit as the morning progressed, forming a pink, then white, cap. Some time after sunrise a party of 12 choughs called as they left their overnight roost on the peak overlooking the lake and flew southwards. Sorry to repeat myself but it has been SUCH a crap spring/summer that my technique has got a little bit rusty. What I should have done was to take two sets of exposures – one for the sky and the reflection, the other for the land surface, processed each separately and then combined them in software. But at the time I didn’t think of that. Well, it was early! So I had to process individual images quite hard in Lightroom to get the results I was after, and if you look too closely at them the quality is not quite all that it could be. It was my first experience of using Lightroom 4 on difficult images and I couldn’t really see the value of having both “whites” and “highlights” sliders. I also processed a couple of images in LR3 and it seemed to me that the “recovery” slider did just as good a job! I also noticed that the new “blacks” slider was a lot more subtle than the old one. It also seemed to have less effect on the (apparent) colour saturation of the image. There is definitely quite a learning curve associated with Lightroom 4, and I’m still fairly low down on it. Time will tell how much of an improvement the new version actually is.